How excited am I that blood oranges are back? That excited ^. Last spring, we planted a tiny blood orange tree in the backyard. And somehow it survived. We won’t let any blooms go to fruit this year but next year, man. Next year. Besides margaritas, one of my other favorite things to have for lunch is this salad. You might recognize it. 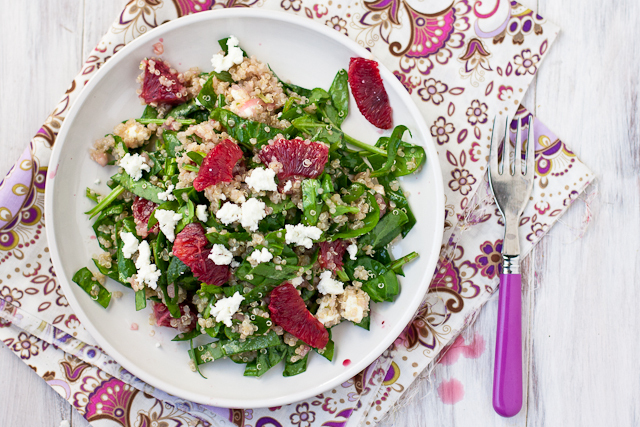 It’s spinach & quinoa tossed with a quick vinaigrette of blood orange juice, white wine vinegar, and shallot and then topped with blood orange segments and crumbled goat cheese. I can make it on the weekend and then eat it cold, straight from the fridge, for the next several days. It sort of balances out those weekend margaritas. Or at least, that’s what I tell myself. 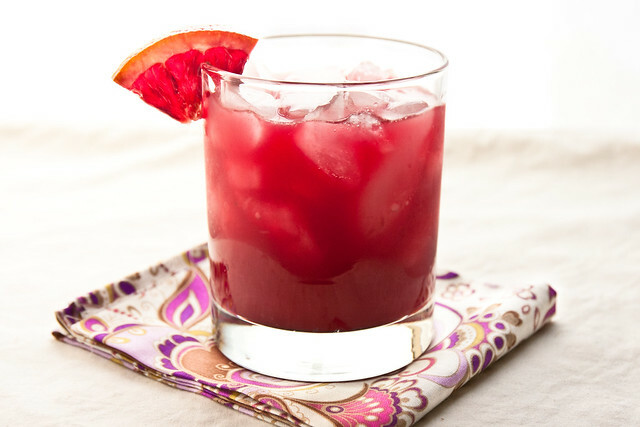 Looking for more blood orange recipes? Check out our winter citrus favorites here! 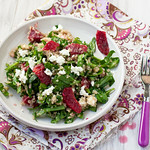 An easy winter salad with fresh spinach, quinoa, goat cheese, and blood oranges in a simple blood orange vinaigrette. *If you're not working with cold, leftover quinoa, spread the hot quinoa on a plate and put it in the fridge to chill, stirring a few times to help speed up cooling. Segment the oranges over a bowl topped with a strainer set - let any seeds and segments fall into the strainer while the juice goes into the bowl below. After segmenting, squeeze all the remaining juice from the "membranes" left in your hand into the strainer. 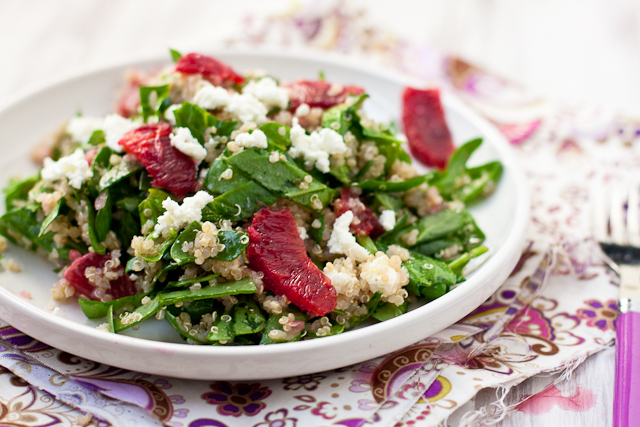 In a large bowl, toss the spinach, cold quinoa, goat cheese, and blood orange segments together. In the bowl with the blood orange juice, whisk the vinegar, shallot, mustard, a pinch of salt and pepper together. Pour over the salad, tossing to mix. Serve cold. Leftovers will keep a few days in the fridge. Wow, what a beautiful dish! 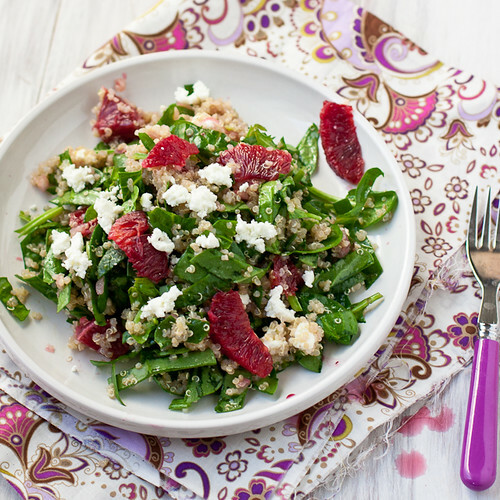 I love the way citrus always adds a refreshing vibrant color and flavor to meals. Definitely my favorite of all the oranges!! And I love it in salads. It adds such a great pop of color along with a great pop of flavor! This salad looks so refreshing and delicious! I love the addition of quinoa! I’m 6 months into this pregnancy, and I CANNOT get enough oranges! This is just another fabulous way for me to enjoy them. Beautiful salad, Shawnda! Love that vinaigrette. I’m finding the measurement on the quinoa a little unclear–is it one cup cooked or uncooked? Thanks!